San Francisco, CA - March 31st , 2014 NAB Show - Fiilex, a leader in LED lighting for the broadcast, film and photo industries, has released the much anticipated Q500 LED Light. First in its "Quasar" line, the Q500 has an equivalent output of 750W while drawing only 185W of power. The light uses their patented Dense Matrix LED™ array to pack many LEDs together in a very small space. It is dimmable from 100% to 5%, with smooth transitions, and has an adjustable beam angle ( 27°-50° with the included fresnel lens). Fiilex lights are known for their color tunabilty. The Q500 can be tuned between 2800 - 6500K, and has a >93 CRI (3000-5600K). The light also includes Hue Control of ±.25 Magenta/Green. 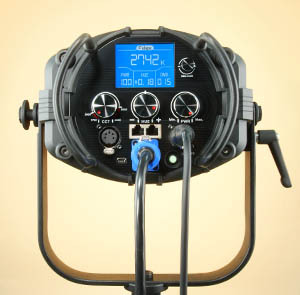 The light is "Flicker" free at any frame rate, and features a built in LCD display for accurate adjustments. As with all Fiilex lights, the Q500 emits no harmful UV Light / Radiation. This is Fiilex's first light with Built in DMX Control it features 512 Addresses, LCD Display, connection via the two XLR ports (in/out) or two RJ45 Ports (in/out). Light Intensity, Color Temperature, and Hue, can all be adjusted via the DMX protocol. "We wanted to build a light that not only met the professional's expectation, but exceeded it," says Brent Siebenaler the Brand Manager for Fillix, " We have done just that. The Q500 is perfect for the broadcast studio, the film set, or a photo shoot. It offers a level of power, control, and quality that hasn't been seen before." The Q500 utilizes Dense Matrix LED™, this patented technology allows for placement of many LED chips in a tightly arranged pattern. The result is a super - bright point - like illumination source with high CRI (Color Rendering Index) and adjustable color temperature. This proprietary technology is unique to Fiilex. The Q500 comes with adjustable Barndoors, a 5" fresnel lens, and an AC Power Cord. It has a magnetic accessory mount for the compatible Fiilex accessories. The Q500 is available for order now from dealers throughout the U.S., Canada, and Europe, with delivery in mid May. The U.S. retail price is $2495.00. For a complete list of dealers and accessories please go to www.fiilex.com.